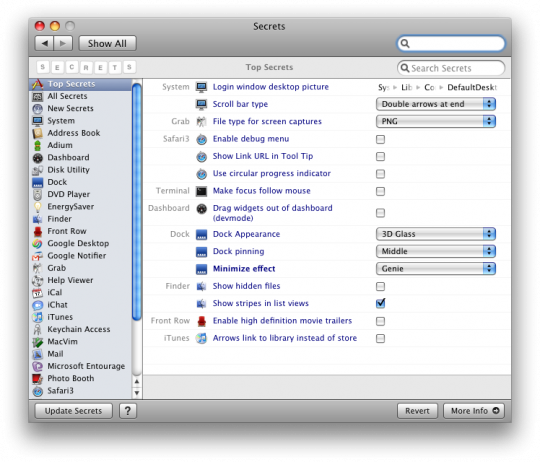 I suggest you use the Secrets Prefpane from blacktree. Just download it from the link near the top of the web page, unzip it and then install it by double-clicking on the resulting file (Secrets.prefPane). 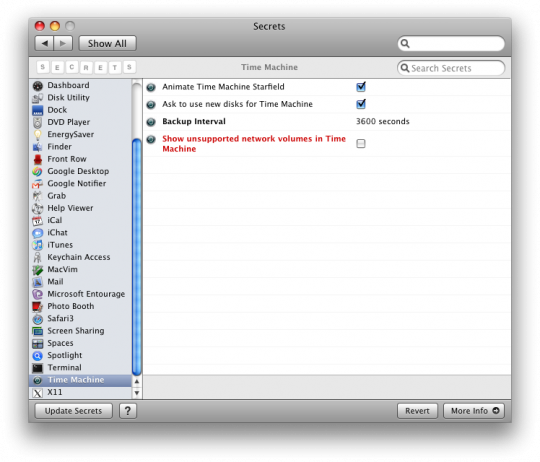 Secrets prefs for TimeMachine don’t appear to work for me. It doesn’t change the 1 hr. backup interval. Doesn’t appear to presist the new value (3600 default) is always present after launching Preferences – Secrets. Odd — so you set the interval to something different, come out of the Secrets prefPane, go back in and the number has gone back to 3600? I read your posting, installed Secrets and had the same result: no changes. Every time you re-open Secrets it’s reverted back to the 3600 setting. Even more vexing is if you try and edit the file (as written up on other sites) I get a message telling me that I don’t have the authority to change the file. And here I thought I paid for the computer! Despite following Apple sites directions I still couldn’t get the file to allow me to edit it to allow me to change the interval. I purchased my MacBook Pro because I thought Apple was better. After 4 months I regret my decision on an almost daily basis. A thought: does your account have administrator privileges? 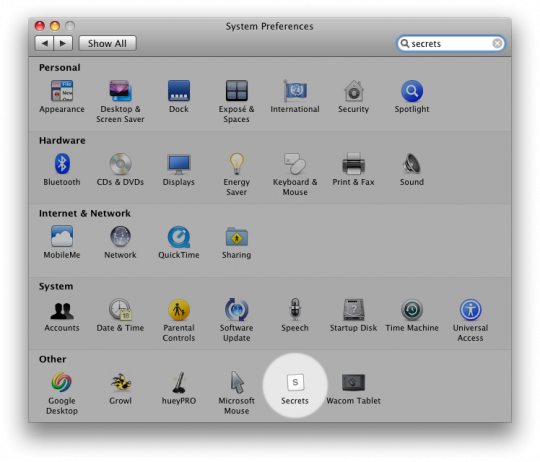 If you go to System Preferences->Accounts and click on your account, is ‘Allow user to administer this computer’ ticked? Thanks for the post in response to my comment. Yes it is ticked. Your explanation is clearer than Apples but neither results in being able to edit the file that other sites refer to. I did download Time Machine Scheduler and am trying it out. I can’t figure out if it’s working–haven’t paid attention to the actual backup times–but the last I checked it’s still scheduled for an hour interval. This is truly frustrating and again: I’m very disappointed in Apple. It’s as though they hired some cast-off Microsoft employees and their viral thinking has infected the company. Maybe my time machine is strange but it doesn’t work for me? I believe I have an understanding of why solutions such as Secrets prefPane don’t appear to be working. The time interval for a Time Machine backup is declared in a launchd plist file. However, you have to restart your machine for any interval changes to take effect – the launchd daemon interval won’t change otherwise. This is true even for your command line solution, and might be why other programs (such as the Secrets prefPane) still “see” the old value, even after (apparently) applying the change. Think of system launchd plist files like the old AUTOEXEC.BAT and CONFIG.SYS files of MS-DOS. Changes to those files wouldn’t have any immediate effect on how the system was running – you had to restart the computer in order to see the effects of those changes. The launchd plist files for Time Machine work the same way. There seems to be a fair amount of misinformation on the internet, related to confusion over why the interval change doesn’t take effect immediately. (Even the authors of TimeMachineScheduler seem confused about this, in the first description paragraph on their program’s website – which gives me cause to seriously question the validity of their software offering.) It’s easier to understand once you know how launchd works. To confirm this, I used the excellent open-source program Lingon (http://tuppis.com/lingon/) to modify my plist file for Time Machine, setting the interval to every two hours instead. After rebooting, the Time Machine UI still erroneously thinks backups will be happening every hour (this is apparently hard-coded, and make it appear that the interval change had no effect), but the backups themselves take place every two hours, just as I instructed! Lingon is now no longer available. Why is it so darn difficult to change the interval? Seems like Apple doesn’t want people changing it. Lame. Thanks for the command line instructions. I am completely ignorant of this guru type stuff, but never the less followed your instructions. But how do I know if it did anything (other than waiting and watching for five hours)? Thanks. This is cool but what if I want to schedule a specific time, say 1:00am for my Time Machine to backup? Can I run it off some cron job instead of its own scheduler? I find that whenever Time Machine runs it consumes so much of my home network bandwidth that my Vonage calls start stuttering. I downloaded Time Machine Editor and set it for a once a day at 01h00 backup. I’ll see if it works, and report back. Did the TM editor work to schedule TM once a day? Yes, works like a charm. I have it set up to backup every night at 1:00AM. I tried the default writes solution and it didn’t work at first. No change took effect. Then I checked the actual plist file and found (in the get info window) that its permissions had been changed to be readable only by system. I added read only permission for everyone and then the change took effect. I wonder if this is what’s going on for some people with the other utilities not working. TimeMachine doesn’t have root level permission to read the preferences file so it can’t make the change. Thanks again for the info here. Thanks a lot! This was exactly what I was looking for and extremely helpful!!! When TimeMachineScheduler (TMS) installs, it posts a notice that the setting for Time Machine in the Time Machine Preferences Panel must be “off.” Somewhat counterintuitive, but I presume that Apple’s Time Machine Preferences Panel somehow overrides the settings in TMS. TMS can limit backups to a set time by excluding all other times (i.e., exclude 1:15 AM to 12:55 AM). Thanks MICHAEL SOS…..i kept reading that the setting for time machine had to be off but i kept thinking that only meant while i was doing the setup for time machine scheduler. now i realize the setting is ALWAYS left in the off position for the time machine scheduler to work. Michael – this command line script is VERY helpful, as is all the advice in this thready – thanks!